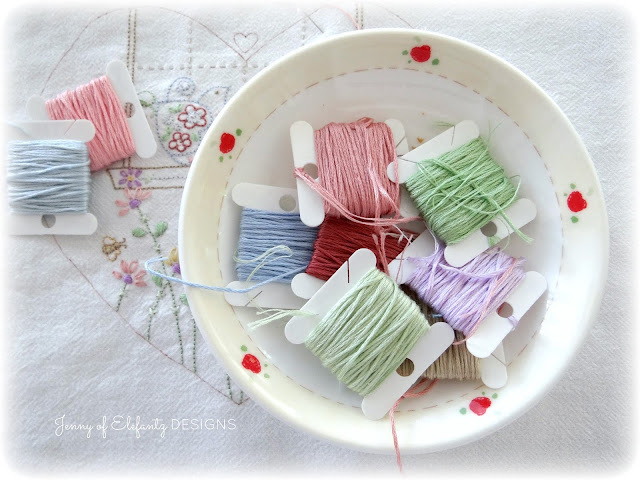 Gathering together a handful of embroidery threads which so beautifully blend together is a rather thoughtful and unhurried occupation for me when preparing a new design. I can remember many times when I've traced a stitchery and Mr E has asked if I'd like to watch a movie with him, but I still haven't chosen my threads so I reply "Just give me 10 minutes to choose my colours." Ten minutes? Well, that's wishful thinking to say the least. More like an hour, or two or four. I take my background fabric choice very seriously, but choosing colours definitely takes more of my time than that. Fortunately I usually have a spare stitchery 'on the go' somewhere for those movie dates now, having learned to have a back up so I don't keep my beloved waiting. At the moment I'm still cutting into one of my flour sack towels and have almost completed a third project from it. There's still enough left for a fourth, and I must admit it's simply beautiful to stitch through. Each design has been embroidered with a different blend of threads, but I'll wait till later in the month to show them to you. 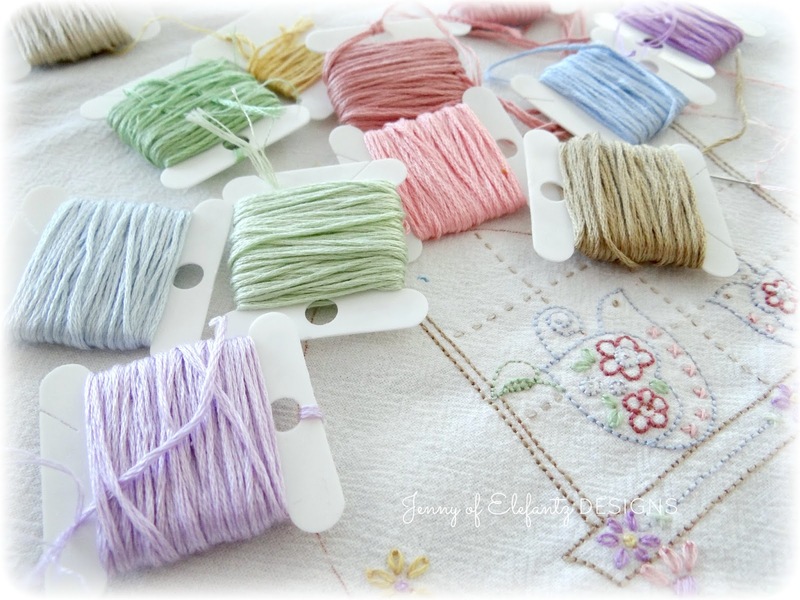 Today you shall just have to be content with a few peeks at number three and the pretty pastel threads which are making it sing. Now, how are you going with Mothers Day gifts? I admit this celebration doesn't ring on my radar until the day has almost arrived because Mr E and I both lost our mums when we were babies so it's not something we have ever had to think about for ourselves. If you're after something sweet and quick to make I've added a free pattern to my Craftsy shop which might suit a few of you as a gift for mum, grandma, or aunt. 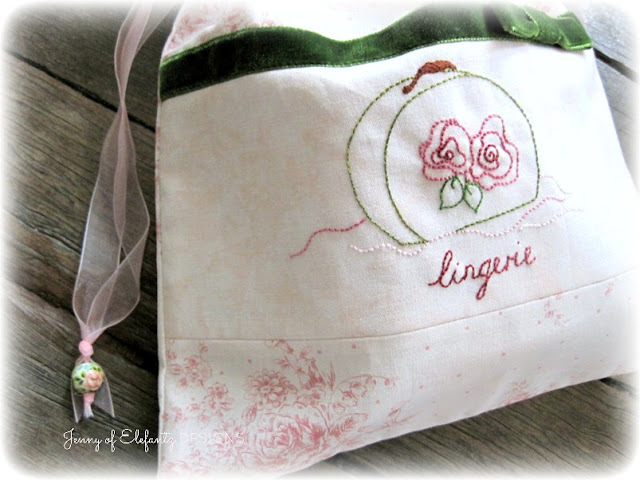 This lovely lingerie bag can be made up in a day, or stitch the design the night before and you can finish the project next morning. 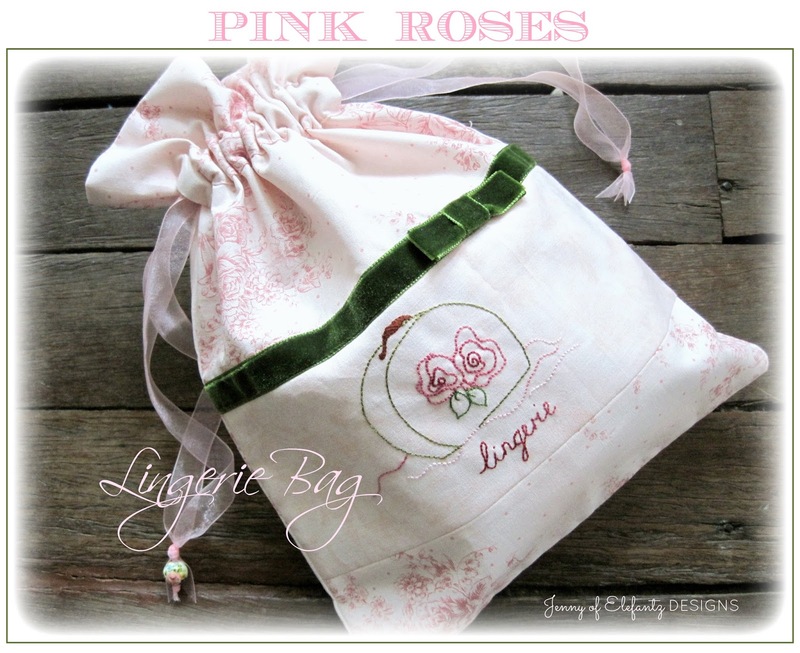 Download the free pattern for "Pink Roses Lingerie Bag" here. Remember my potted garden from a couple of weeks ago? 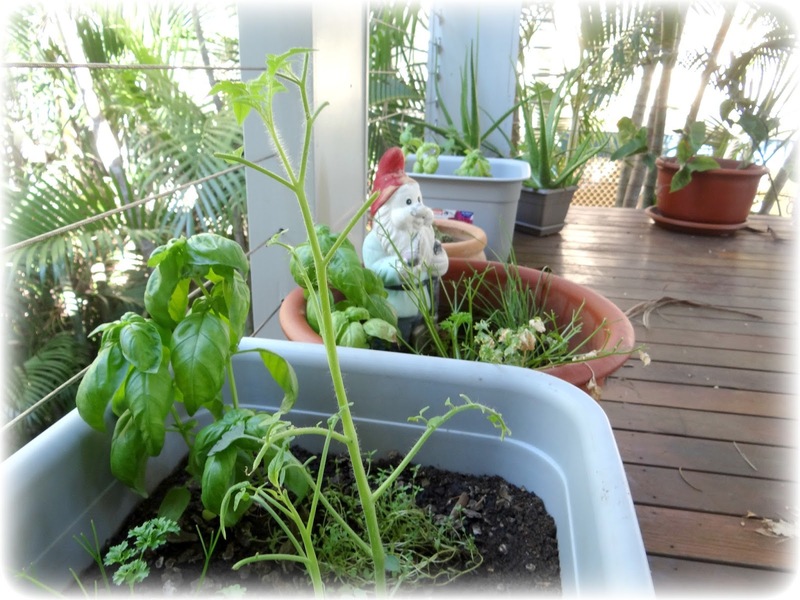 Everything was thriving and I was so excited, until...the grasshopper. We have never seen a grasshopper in our yard and we've lived here for 3 1/2 years, but we've seen one now! He obviously doesn't like basil, mint, thyme or chives...just tomato leaves and parsley. 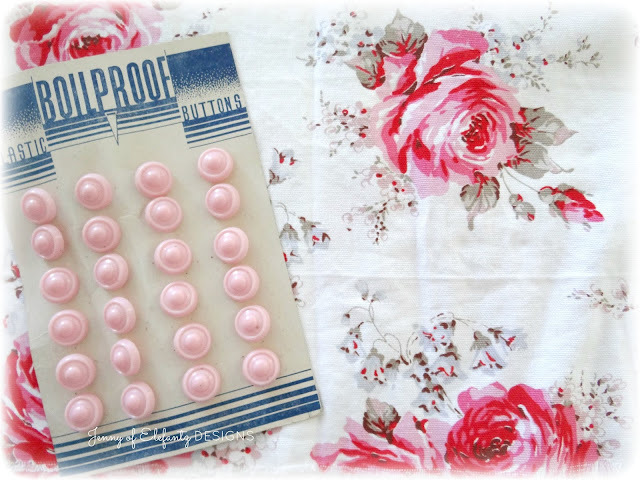 Mr E and I are heading off to the caravan and camping expo in our area on Saturday so tonight I'm going to make a simple tote bag out of this old Cath Kidston fabric and vintage buttons to sling over my shoulder. Rather plain with a pocket at the front I think, because the fabric is upholstery weight and lovely enough 'not to be messed with'. You know what I mean? I really hope you have a peaceful end of week and that it flows right over into your weekend as well. I wonder what your plans are? What fun a new bag! Have a great time Jenny. Love tbe thread choices. 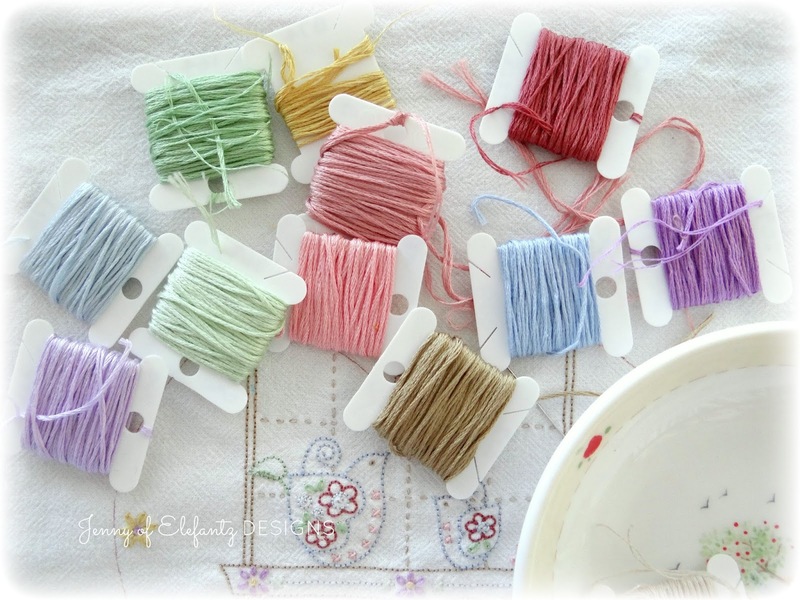 I am quite like you when selecting threads. 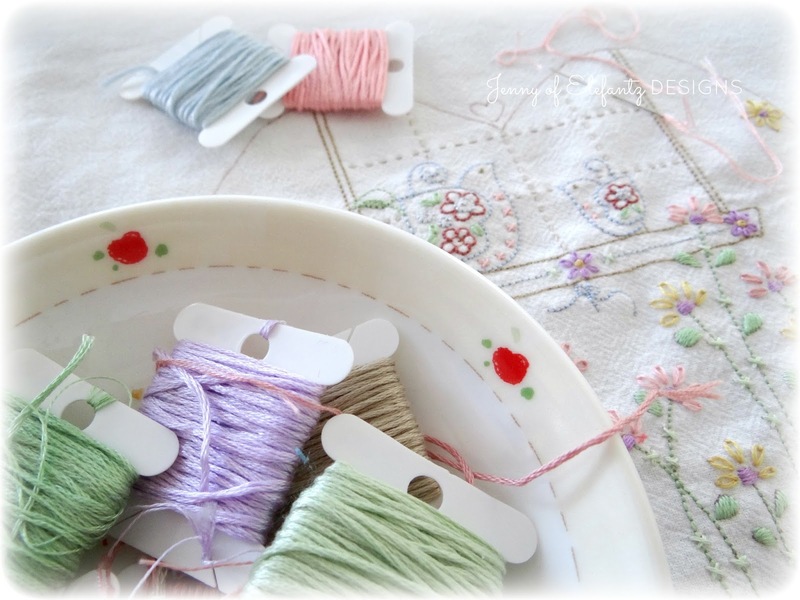 Sometimes I just choose one Cottage Garden thread instead. I started stitching your Heartstrings design for my mum a couple of months ago and put it aside after I stitched borders on it. Now, with only 3 days to go I have no idea what to make it into lol. Your free project is beautiful. I can see myself trying to finish something at the last minute. Naughty little hungry grasshopper. I shall look at some of my books to see if there is a grasshopper deterent. Nice of you to provide it with a yummy lunch. Hehehe. Thank you for the lovely pattern. I sew so slowly that I wouldn't finish by Sunday. But I will make this one. Enjoy your short break. God bless. Happy Mothers Day to you and I hope you have a wonderful weekend. Sorry, can't help with the grasshopper. Maybe a mesh put over the plants??? One grasshopper! I wish... My husband squashes them. But, in our area you can buy grasshopper bait to put out the year before. It kill the eggs of the next generation I believe. 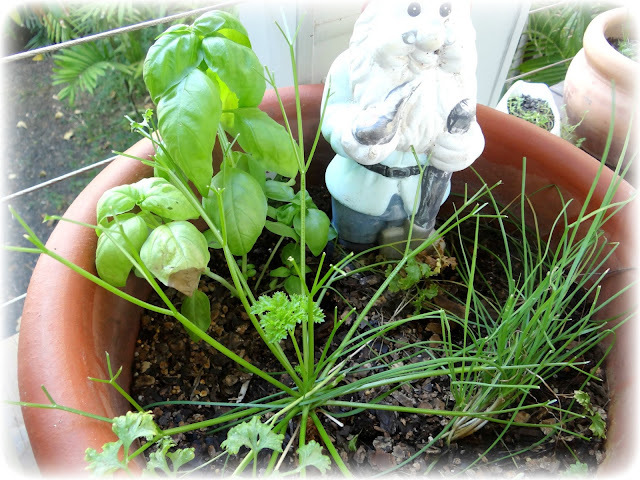 We don't use it, I don't like any kind of pesticides here, thus the squashing. :) Early in the morning when out in the garden you can look at the corn stalks and see dozens of them all lined up at the top of each stalk soaking in the sun. Best time to squash because they move really slow when cold. I have my Mother and my Mother-in-law close by and I generally buy them each a potted geranium for Mothers Day. Love the Cath Kidston fabric. It is hard to come by here in the states. I have a couple treasured peices. 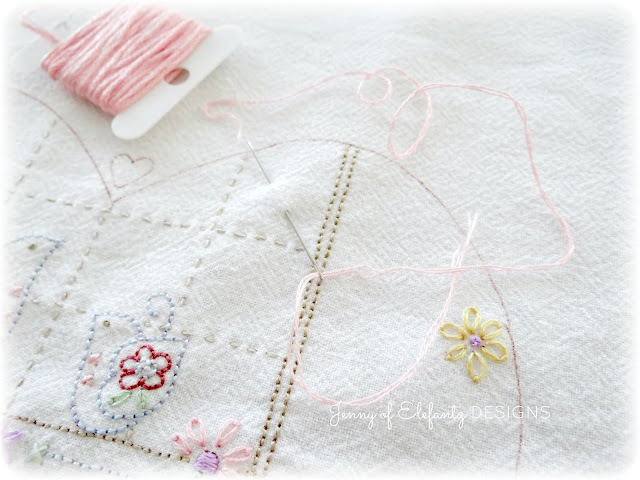 Your new pattern looks lovely, can't wait to see it completed. Many thanks for the pattern, Jenny! Please share photos of your bag when it is done. I love the fabric! Thanks for the lovely pattern. I think it would make a great addition for packing a suitcase. Enjoy your day at the Expo. Don't do what we did last year.....bought a van...we hadn't planned on spending anything....Oops! This year we only bought a water filter. Much better behaved. Good luck with getting rid of your grasshopper. Thank you for the lingerie bag tutorial and pattern, love it. Have just downloaded it and about to make it up for a gift for end of May.It will be ideal for a gift. 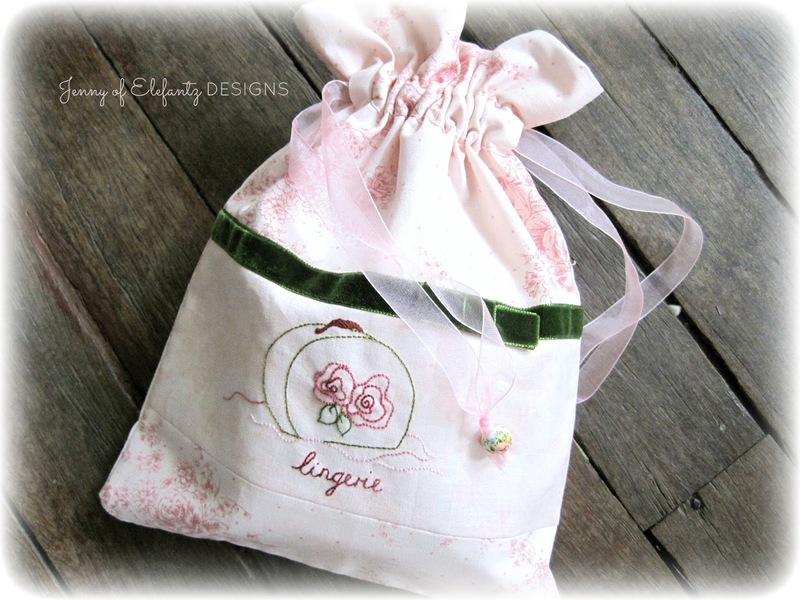 Love your fabric for your tote bag. Enjoy your outing and Happy Mothers day this week end. Can't help with your grasshopper problem, Julie's idea sounds pretty good. Thank you for your inspirations and sweet patterns. Beautiful pattern and such pretty photos. Wishing you a Happy Mother's Day Jenny. Lovely, lovely new threads and wonderful free pattern, sweetie, thank you! I think your Mother's Day is over in your neck of the woods, so I'll just hope it was happy and peaceful. Grasshoppers!! We don't see them anymore - I'm hoping that changes since we don't use fertilizer on our lawns, but everybody else seems to and I think that's what killed them all off. I remember them jumping everywhere I walked in the grass when I was a kid. Can't wait to see the new bag, it looks scrumptious!